Claro President Enrique Ortiz de Montellano and Gov. García-Padilla check out the map showing the AMX-1 cable's route. Claro President Enrique Ortiz de Montellano and Gov. García-Padilla check out the map showing the AMX-1 cable’s route. Puerto Rico on Thursday became the final connecting point of a $1.1 billion high-speed submarine cable system deployed by telecommunications provider América Móvil that is capable of offering broadband transmission speeds of up to 100 Gigabits per second. The AMX-1 Submarine Cable is the first and fastest of its kind, and links 11 cities across seven countries in the Americas — Cancún, Jacksonville, Miami, Fortaleza, Puerto Plata, Barranquilla, Cartagena, Salvador, Rio De Janeiro, Puerto Barrios and San Juan. 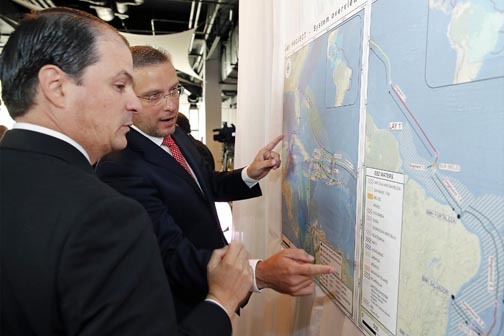 Construction of the next-generation infrastructure that spans 17,800 kilometers began in Brazil in 2012 and finalized its last leg in Puerto Rico last week, said Enrique Ortiz de Montellano, president of Claro Puerto Rico, América Móvil’s local operation. “It will also be the platform that will support future society and a new way of life where distances, time and space will shrink exponentially, changing the way we live because we will be connected always and everywhere, to everything,” Ortiz de Montellano said during a news conference in San Juan. América Móvil included Puerto Rico in the vast underwater AMX-1 system and in doing so, it will connect our island to a better future. It’s a great vote of confidence in the development potential of our clients and of this special land,” he said. The Ile de Batz is the cargo ship owned by Alcatel-Lucent that has been laying down the cable. 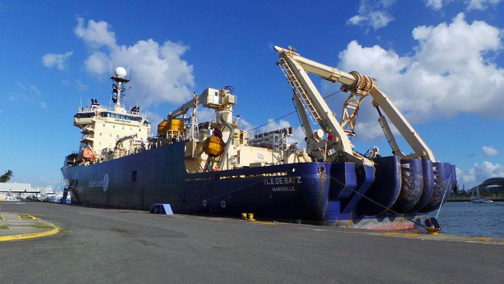 Earlier this week, this media outlet was invited to tour the Ile de Batz, the massive cargo ship owned by Alcatel-Lucent, which has been doing the work of laying down the cable in the region. Puerto Rico has two connecting points — in the Condado area and in Isla Verde. The infrastructure will deliver services to 335 million América Móvil clients in the region, by improving Cloud services, providing greater capacity, redundancy, protection, speed and reliability related to data traffic both local and internationally, in each country, the executive explained. Broadband systems such as those provided through AMX-1 will also benefit social aspects like education, health and government, breaking down barriers to offer pervasive services. “This new and modern infrastructure will benefit Puerto Rico in different ways. First, it will strengthen the services of the Cloud, a new technological development that allows providing services or content through the Internet without the need to install software,” said Gov. Alejandro García-Padilla during the news conference. Hey Buddy!, I found this information for you: "Claro connects Puerto Rico to 100 Gigabit-capable cable". Here is the website link: https://newsismybusiness.com/connects-gigabit-capable/. Thank you.